Happy snowy Monday loves. There's a fresh coat of snow outside and it almost makes me want to go outside and take pictures. I love fresh snow but I hate when it turns into that dirty annoying snow after a few days. Over the weekend I shot some Valentine Day looks in collaboration with some bloggers, my favorite photographer and an amazing florist. I can't wait to share it with you guys. Hope you all had a great weekend. Let's get this week started! I love taking pictures in D.C., there are always beautiful places and areas that make a good backdrop. Only bad part is finding parking lol, but it's definitely nothing compared to NY that's for sure. Last week I went to an event at City Center with my friend Sam for complementary mini-facials at Caudalie Boutique Spa. My face felt so good and was glowing afterwards. 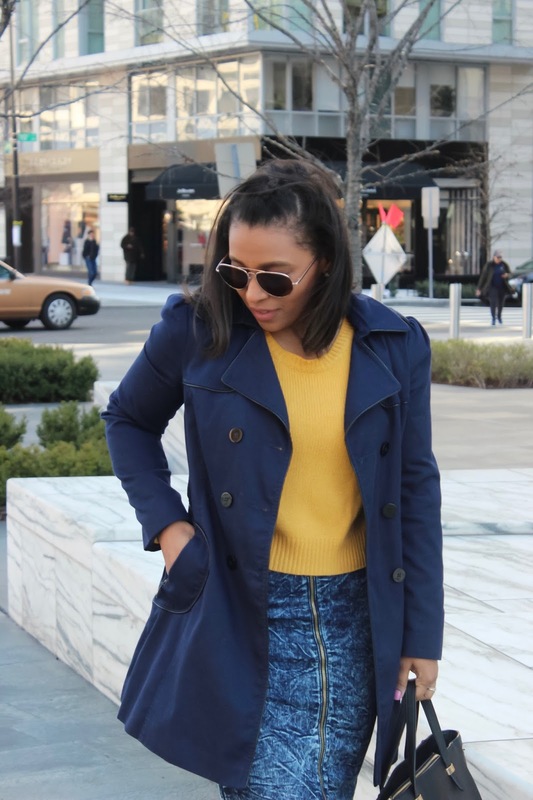 I wore a simple look and paired a high-waist denim midi skirt with a mustard crop top sweater. I usually wear this skirt in the summer but I got away with it but pairing my favorite pair of OTK boots with it. Gave it a winter effect. The structured jacket was the last piece to the look. When my mother in-law visited us down here a few months ago, we went to a local thrift store and she found this amazing coat. Don't you just love thrift finds?! Thanks for reading today's post. Have a great week! Love this outfit! Looks great. Ive been saying for ages need to invest in knee high boots! Thank you! Yes, they are a great investment piece. Looks good!! Loving the knee high boots babe! I say this every time but you have a serious talent for colour pairings! I would have never put these colours together but they look amazing! I love this outfit! never really knew how to pair denim skirt.